The front mount distributor on the 9N, 2N and early 8N tractors was a victim of bad publicity. I believe most of the bad publicity was caused by folks who were afraid to remove the distributor and attempted to service it in-place. Yikes! That is not impossible, but so much more difficult. Remove two bolts, and it comes right off. The front distributor is driven directly off the front of the camshaft by an offset tang. Once you have the distributor in your hand, it can be taken to the workbench to replace points and check the timing. Reinstalling the distributor is easy, especially if you remember which way the rotor was pointing when it came off. Just set the rotor pointing near the same spot before placing distributor against the engine. If the distributor bolts do not seem to line up, the tang is not lined-up right. Rotate the distributor a bit each way till you feel the tang engage, then bolt it up. Even if you didn't memorize the rotor location, or the engine has been turned over with the distributor off, replacing the distributor is still easy. Feel in the front of the engine to get an idea of the camshaft tang position, set the distributor tang to match. Rotate distributor back and forth as you place it on the engine and feel it engage the cam. Try the bolts, and if it doesn't bolt up easy, turn the rotor 1/2 turn and try again. Unless someone has fiddled with the timing adjustment, and the tractor was running ok, the timing is probably ok right where it is, but it only takes a minute or two to check. Less than that if you are fortunate enough to have a jig such as the one made by The Old Hokie, Dan Allen. Browse the N Board at ntractorclub.com and get one when he offers a batch for sale. Once set, the timing should not change. However, low quality replacement parts make it more and more important to check everything. Some people have run into parts that simply do not fit right. If your new points are not made and gapped EXACTLY the same as the ones you are replacing, your timing could change. There are cases where people had to enlarge holes or drill new ones to get a set of points to fit! Try to buy the highest quality replacement parts available. Return or throw away parts that do not fit right. The time inferior parts will cost often just ain't worth trying to use them. It is not a good thing when we find ourselves modifying original parts to make inferior replacement parts work. Sometimes there are no other options. While you have the distributor on the bench, its easy to check and reset the timing adjustment if necessary. Remove Wire to Coil. Pry bail forward and remove Coil. Release clips and remove Distributor cap. The coil and cap can stay on the tractor. No need to remove any wires. Two small bolts hold the distributor on. I grab a 1/2" box end wrench sit on the tire. Take note of the direction the rotor button is pointing as soon as the distributor comes off the engine. This is the direction it needs to point when the distributor goes back on. The distributor will not fit right with the rotor pointing any other way. Don't worry too much if you forget, or someone cranks the engine with the distributor off. It's not that hard to find the correct position later. Turn the distributor around and look at the back side. You will see the offset tang that engages the camshaft. The offset is obvious when you look directly at the back-side of the distributor. If this is an original casting, it will have an arrow cast into the back face showing distributor rotation. If no arrow, it's a replacement aftermarket casting. That's ok, the replacement distributors seem to be decent quality. One of my spares is aftermarket. I just drew my own arrow with a sharpie. Rotation is clockwise, when looking at the back-side. Take the distributor where you can get comfortable and have good light. Mostly it's the front bushing, the little one, right behind the rotor, that holds the end of the distributor shaft. Rotate the distributor shaft until the points are open, then watch the points while trying to move the distributor shaft side to side. If you can see the point gap change, the bushing is worn and needs to be replaced. No problem. That just means we get to have a little more fun with the distributor. Remove the rotor. Pay attention to how the condenser wire connects to the points. Remove the points and condenser. Remove the screw and timing plate on the side of the distributor. The entire points and top plate assembly is held in the distributor body by a large wire clip that runs most of the way around the inside of the distributor. Take a photo or remember how that wire clip is positioned. It should pry out fairly easy with a small screwdriver. Easier if you have a set of snap ring/o-ring pick hook tools. Start at one end and work the clip out. The plate then pulls straight out IF you actually took the timing screw and timing plate off. Once the breaker plate assembly is out, the distributor shaft and advance weight assembly should pull right out of the distributor body. Clean everything thoroughly. Check all the spring tabs, weights, and rivets. Make sure the advance weight mechanism works smoothly. The weights should swing out away from the distributor shaft smoothly, and spring tabs on each weight should pull them back smoothly. The next photo shows the advance weights and distributor shaft assembly completely taken apart. There is no need to go this far unless the parts are really dirty, and won't move smoothly. 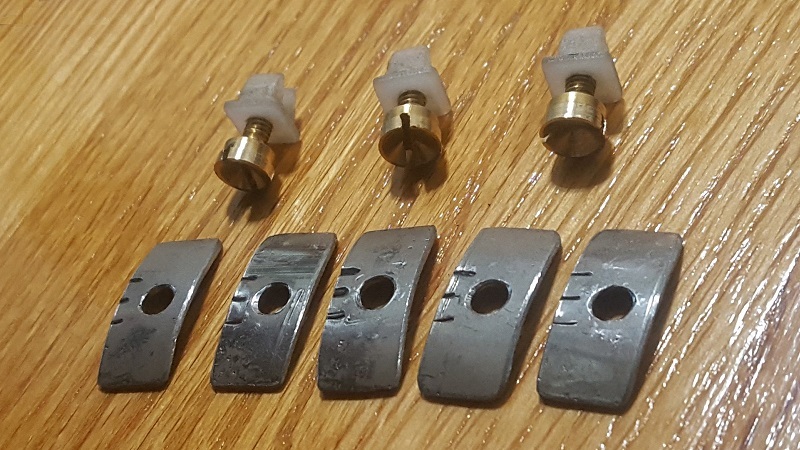 These parts are held together by small spring clips. Use a small pick tool to work one end of the clip out of the groove, then continue around until the clip is out of the groove. Nothing really wrong with these parts once they were completely clean. Look for scored shafts, bent or broken spring tabs, and loose bushings. Each moving part should fit snug and move freely. Bushings can be replaced. Other parts can be purchased separately, but if too many parts need replacing, it might be better to use this one for parts and buy a replacement distributor. If everything looks and works as it should, put the distributor shaft and weights back together making sure all moving parts have a very light coat of motor oil. Too much oil will just cause problems. There were two extra parts in that photo. One is the special coil / condenser screw that connects the condenser terminal to the points, and provides a place for the coil terminal to connect. These screws get lost, worn out, or broken and are impossible to find. 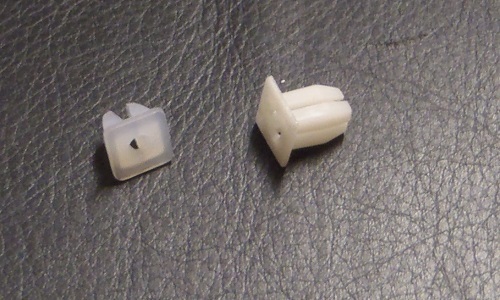 The new one is an 8-32 x 3/8" thumb screw that looks like it may be a good replacement (with a little work). The front bushing is in a small (weak) bracket that is riveted to the distributor plate. The new bushing can be used to press out the old one as it goes in. Carefully! Apply pressure only to the bushing. Do not press with the support bracket unbraced. It is easy to bend the bracket out of alignment. Do that and you will need a new distributor plate assembly. If you don't happen to own a professional set of bearing/bushing driver tools, there are other ways. Find a short bolt that fits snugly inside the bushing. Select a 12 point socket that the new bushing barely drops inside. Remove the points from the breaker plate. Turn the breaker plate upside down on the open end of that socket. Put the bolt thru the new bushing, and then into the old bushing. The bolt will be used as a bushing driver. Never bang or press directly on a new bushing or bearing. Work slowly with a hammer or press. The new bushing will slip into place as the old one goes into the socket. This may still have created a small ridge on the edges of the bushing. Test-fit the distributor shaft in the new bushing. It should be a snug fit. If it's too tight, a round file can be used to carefully chamfer any bump that may have formed at the edges of the bushing when driving it in. Check the larger bushing in the distributor body. This one is usually ok. Put distributor shaft in bushing and check for an side play. If bushing is loose, replace the same way as described for the front bushing. Lubricate new bushings with a very light coating of motor oil. Just a little, we don't want motor oil getting all over the points. Place the distributor shaft in the distributor. Put the breaker plate in with the timing screw lined up with the hole in the distributor body. The bracket for the timing screw should be visible somewhere within the slot in the distributor body where the timing plate and screw goes. Do not install the small timing plate or timing screw yet. Install the big wire clip on top of the breaker plate. The flat side of the clip runs vertically past the timing screw bracket. The open side of the clip ends up at the top. Make sure all of the clip goes all the way into into the groove. Wipe off any oil that may have been pushed out of the bushings. Install the points loose. The points may be in two pieces. There is a base plate with fixed contact, and a movable contact arm held in place with a small cotter-pin. The base plate has a center slot that fits over a bolt head, then is secured in place with a screw at each end. Leave those screws slightly loose for now. That center bolt head is an eccentric cam that is used to set the point gap. Turn that screw head, and watch the point base plate move back and forth. The main reason we left the timing screw out is so we can rotate the breaker plate far enough to get a screwdriver on both screws that attach the points spring and condenser contact. Just rotate the plate until a screwdriver will work thru the hole in the top of the distributor body. Don't install the timing plate and screw yet. Carefully inspect the installation of the points spring, copper foils, condenser wire, and special top screw. The two screws that these items attach to must be completely insulated from the rest of the distributor metal. The arrows and red line in the photo above show where a copper foil strip connects the two terminals. Make absolutely certain that nothing in that area can touch any other metal in the distributor. The special top screw may have been replaced with something else. 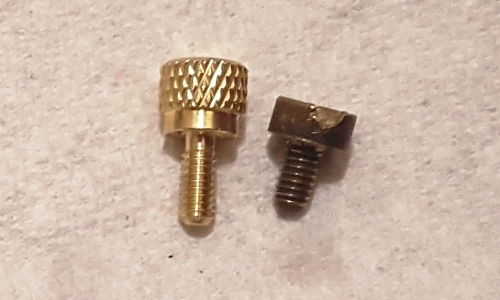 The screw is not available as a replacement part. 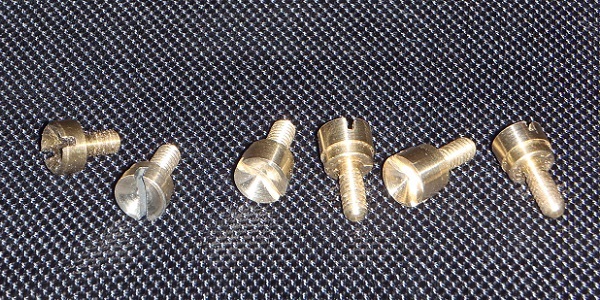 I have machined a few replacements using brass thumb screws as a starting-point. The nylon insulator for a 1/4" square hole is a little easier to find, but usually comes in packs of 50. If you need a new screw/insulator (as pictured below) drop me a message using the form on my contact page. Set the point gap to exactly 0.015". The manuals often state a range of 0.014" to 0.016" but I have found that my tractors work best when I take the time to set the gap dead on 0.015". With the screws at either end of the points slightly loose, turn the eccentric screw in the middle to set the correct gap. Tighten the screws at each end. Check the gap again to make sure the points didn't move. They usually do. If they moved open or closed, loosen the screws and adjust the points slightly more or less than perfect, so when the screws are tight the adjustment will be perfect. This process nearly always takes a few whacks. If either points screw is stripped, the fix is to replace with a slightly larger diameter screw. 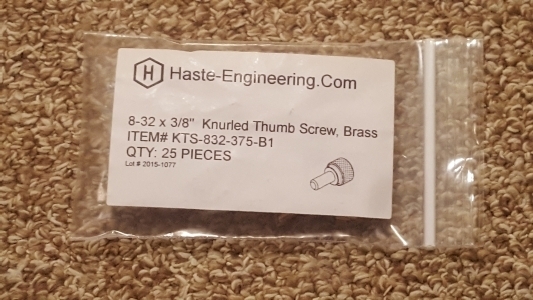 The replacement will be a very short length #8-32 screw. That length should not any longer than necessary to engage the threads in the top plate. Longer screws will interfere with the rotating advance weights below the top plate. Screws that are too long can be cut off and used. If your top plate already has the larger diameter screws, it may be time for a new top plate assembly. You can stop looking. The front distributor engines have no timing marks ot pointers on the crank pulley or the flywheel. 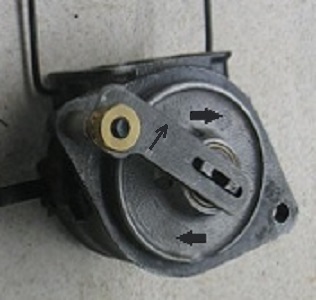 The only external timing marks are on a small plate on the side of the distributor. This external timing adjustment may have been intended to compensate for using different grades of fuel. Today we generally just run regular pump gas, which is consistently the same octane, so the external adjustment is very rarely used. The front distributor engines do not have external crank or flywheel timing marks because they are not needed. Timing adjustments are set on the distributor when it is off the tractor being serviced. The point gap must be set first before setting timing, so go back to the previous paragraph and do that if you skipped it. 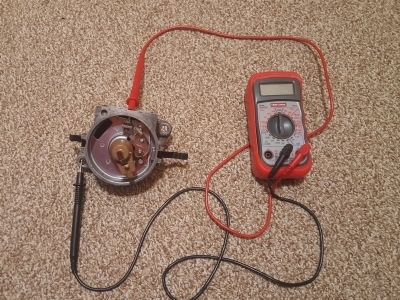 This photo shows how to measure the 1/4" timing adjustment on the front distributor to set it at zero degrees TDC. 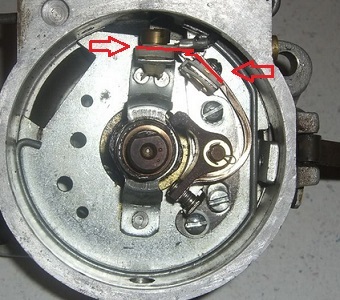 Place a straightedge on the wide side of the tang on the distributor shaft as shown in the photo. Rotate the distributor shaft in the normal direction until the straight edge is 1/4" away from the outside edge of the distributor mounting hole. The distributor points should just be starting to open. If not, turn the timing plate until the points are just beginning to open. It is best to turn the distributor shaft in the correct direction to the 1/4" measurement. This will remove any slop in the advance parts. The 1/4" setting will set your initial, fully-retarded timing at top dead center. That is correct for these engines. Is it just me or does this timing adjustment look like something the engineers came up with after the distributor was designed and hundreds were in production? 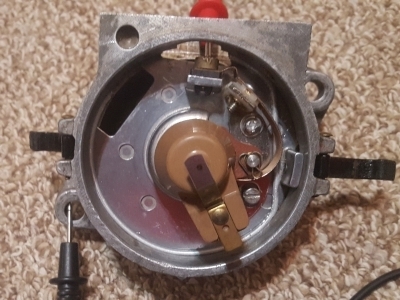 It seems obvious that if timing had been considered prior to production, a timing mark of some sort would have been cast into the distributor body. Really? We are supposed to turn it so the wide side of this thingy is turned to point 1/4" away from the edge of this hole"? Just idle speculation on my part, but this looks like a big OOPS that generated a mountain of memos before someone came up with a solution that allowed production to continue. This is a timing jig made by Dan Allen (The Old Hokie). 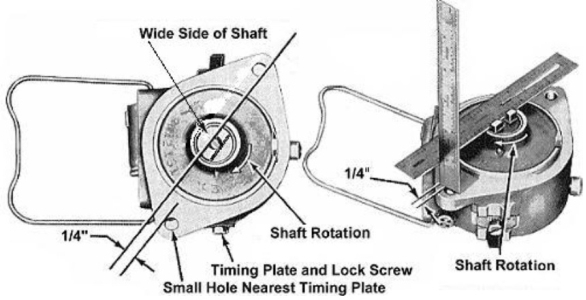 The arrows showing distributor shaft normal rotation help prevent confusion when flipping the distributor from front to back. Again, with the wide side of the distributor tang pointing 1/4" past the bolt hole, turn the breaker plate until the rubbing block for the points just maked contact. This is why we left the timing screw out when the breaker plate was installed. IF you can get still see the threaded hole in the timing screw bracket, GREAT. Install the small timing plate and tighten the screw. I'm not that lucky. Most of the made in China replacement points available today are not exactly the same as the original points. In many cases there will not be enough length to the timing slot to get the timing set correctly. There are two solutions. 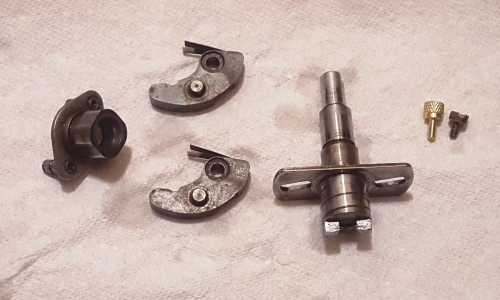 Buy a different set of points and start over - or - Disassemble the distributor, remove the timing plate, distributor shaft, and carefully file the timing slot longer in the direction it needs to go. I've done this a few times with a rat tail file in about 30 seconds. File a little more than necessary to allow some extra adjustment. The cast housing material is soft and files away easily, so don't get carried away and file so much the timing plate won't cover the slot. This is one of the things that happens when points are not made exactly to specifications. Filing the slot to set the timing will move the special screw off to the side. This makes it more likely there will be problems getting good contact between the coiled springy terminal on the bottom of the col and this screw. The solution is a combination of carefully bending the bracket for the top screw and carefully bending the coiled terminal so it is offset to the new brass screw location. Don't get turned around flipping the coil over and bend anything the wrong way. Bend the coiled terminal by prying between the individual coils so the solder joint does not come loose. Some of my replacement special screws are made a bit taller than the originals. This is an attempt to make a more positive connection to the coil terminal when things won't line up as intended. Here's another part I couldn't buy, so I made a few. For some reason the little timing plate on the side of the distributor gets lost and nobody makes them. Turns out 16ga exhaust pipe is the correct thickness. Cut a couple of bands from the end of an old exhaust pipe just over 1/2" wide. Cut to lengths just over 1" long. Drill hole centered in length but slightly offset to one side. Match curve to an original part or side of distributor body. Grind to final size by bolting a stack together with an original in the middle. 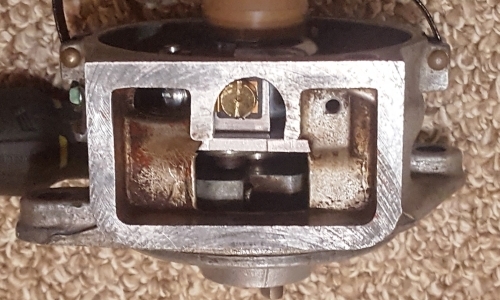 Stamp timing marks in fat side, aligned with the bolt hole. Three marks was the best I could do with the stamping set I have. It should be possible to do 7 equally spaced holes like the original on something like a milling machine. This is good enough for me. The timing marks don't really serve any purpose if you time the distributor as shown in the manual. The marks might help jog my memory when these thingies turn up in my parts bin several years from now. Before installing the distributor on the engine, use a test light or ohmmeter to check that the points are opening and closing electrically. Place one test lead on the hollow screw where the condenser wire connects. Place the other test lead on the distributor housing. Turn the distributor shaft and make sure you can see the points open and close. Check wire connections and copper flex strip for shorts. Drag a point file between the points until any varnish is scraped off, and they are working. TIP: A point file isn't really a file. A proper point file is really a burnisher. They are usually about 3 inches long, very flexible, with a square tip to help get it started between the points. A burnisher cleans and polishes the contact surfaces using normal spring pressure as it is drawn thru the points. Recently a no-start condition with my 8N was eventually diagnosed to a build-up of something on the points. They showed closed with a test light, but actually had some electrical resistance when closed. Just enough resistance the coil would not fire. This was not improved until an actual fine tooth file was run thru the points to scrape them clean. Once they were showing zero resistance closed, the burnisher was used to remove file marks and polish the points. Problem solved, it started right up. Don't ask how many times the points were checked and how many other things were cleaned or replaced before this problem was found. When installing the distributor, the slot in the end of the camshaft (front of motor) is offset. The tang on the distributor will only mate easily to the slot on the camshaft one way. If you have it lined up correctly, the distributor will fit flush to the motor and the two bolts will go in easy. If the tang is 180 degrees off, the distributor bolts will not line up (you might get one but not the other). If the tang isn't in the slot at all, the distributor will not fit flush to the front of the engine. If you force it, the casting on the distributor will break. It is not real hard to get things lined up right, but it is easier if you remember about which way the rotor was pointed when you took it off. These engines can be very sensitive to timing and need to be very close to dead-on Top Dead Center for it to start easily and run right. If the point gap is set perfectly and the timing is adjusted exactly as shown in the manual, they should start and run well. Miss just a little bit on either adjustment and you can "fix" it by making a slight adjustment to timing without removing the distributor. Loosten the timing lock screw, shift the timing about half a mark, tighten the bolt and see if that helped. This simple trial and error approach, making small adjustments one at a time and then testing the results, is often the best way to find that perfect final adjustment. No two engines are exactly the same, and factory settings can be tweaked slightly. The key is to keep track of each change so you can undo the change if there was no improvement or things got worse. Fortunately, my 2N is perfectly happy with the distributor set up on the bench.